One of the best things about my craft beer hobby is that there is always something new and different to experience. There are always new breweries or brewpubs to visit, experimental, seasonal, or special beers that I want to try, or new ways to enjoy a beer. I’m experiencing so many new and cool things in my world of craft beer, that this blog can’t keep up! So I had an amazing beer first this week: a Beer and Chocolate Truffle Tasting at Gordon Biersch Rockville. Christian Layke, head brewer at Gordon Biersch Rockville, and Chef Randy Olmstead of The Perfect Truffle in Frederick teamed up to offer the Beer and Truffle Tasting to a packed private room of rapt beer and chocolate fans. Over two hours, the duo introduced their creations and explained the thinking behind the pairings. Apparently, a lot of time and energy was spent on researching the perfect menu – Christian and Randy described how they spent six hours over two days sampling a variety of beer and truffle tandems. After more than 25 different pairings, they settled on a menu of five beers paired with seven truffles. The banana nose of the Hefeweizen was the perfect complement to the tropical flavors of the Coconut Truffle. The Saison’s tropical fruit flavor and dry, clean, tart finish was matched with a truffle with a banana-mango center and topped with toasted coconut – amazing! But the pairing of the night may have been the spicy Saison and Cayenne Truffle, which was made with pepper caramel and passion fruit. This one was the talk of the dinner. As Christian described it, they took us out of our comfort zone with the last beer/truffle course, so the Märzen and Mousse pairing was designed to bring us back. And this duo was a classic. Gordon Biersch makes a very drinkable and smooth Märzen, and the Mousse Truffle had a lovely dark chocolate center with a subtle cinnamon finish. Gordon Biersch’s Czech Pilsener is made with Salz hops – “the noblest of the noble hops” – and those hops harmonized with the nutty-grapefruit flavor of the Hazelnut Citrus Truffle. 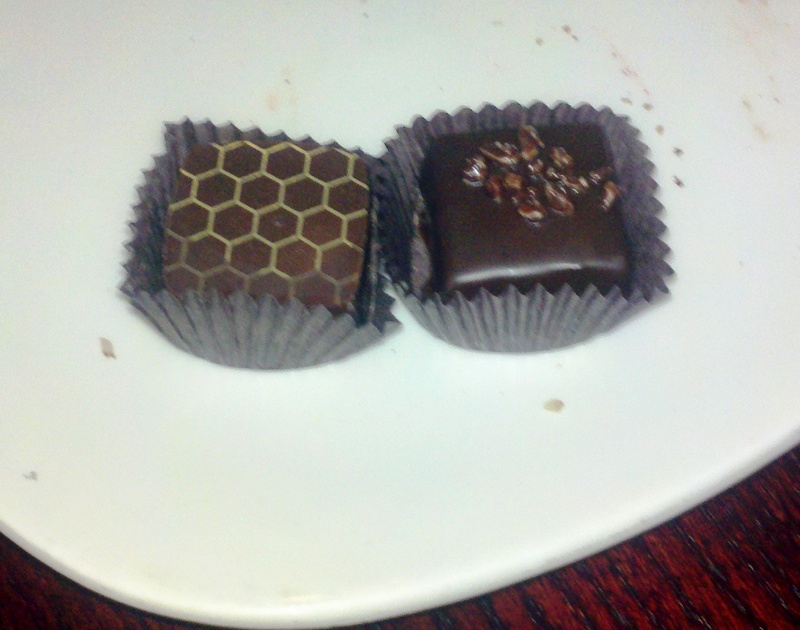 The Honey Ginger Truffle, made with white balsamic, was a different story. This was my least favorite pairing, as the ginger and balsamic were a bit over-powering for my taste and the light Pilsener didn’t quite hold up. The Beer and Chocolate Truffle Tasting finished with a flourish with this combination. Christian’s Oak-aged Brown was a 50/50 blend of his Brown Ale aged on new oak and Brown Ale aged in bourbon barrels. It was smooth and velvety, with a beautiful bourbon nose and vanilla notes. The brew, along with the Peach Bourbon Cobbler Truffle made with Jim Beam, was a dessert like none other. This beer tasting was quite an indulgence and as I savored the last sip of beer and bite of truffle, I have to admit to feeling a bit relieved – I’m not sure that I could have survived one more course of beer and truffles. Great job by Christian and Randy at putting together a menu that was just right.